Bing just unveiled a number of updates now available in the Bing Maps service. At Microsoft’s San Francisco campus, select journalists and other attendees were given a first look at the new Bing Maps Beta on Wednesday. Included in the update were a number of new features including streetside views, Photosynth integration, and “mapplications,” aka “Bing Map Apps” which let you layer data from different services over top of the map you’re viewing. (Check out the video on Channel 9 to see these features in action). The new streetside view takes advantage of Silverlight 3 technology to provide ground-level photos of a scene which can be rotated 360 degrees and zoomed in and out of, just like with any Silverlight interface. The new view also shows street labels, vector info, and uses reverse geocoding to identify your location with an address block. 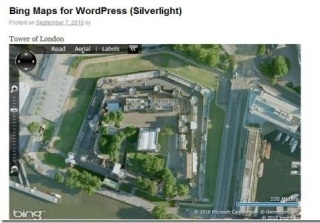 Also taking advantage of Silverlight 3, the always amazing “Bird’s Eye” view has been updated as well. This view shows buildings as 3D models, which, if you’ve ever tried it, is a much better way to see an area than by viewing traditional aerial photography. And while in this view, you can click on a button of a little blue man representing your location to jump right into streetside view. Another feature in the beta is native Photosynth integration. Any synth geo-tagged on Photosynth.com is now available within Bing Maps for viewing. You can turn this feature on from the new Application Gallery. This App Gallery hosts a number of “mapplications” in addition to Photosynth which let you mash up various services with Bing Maps. 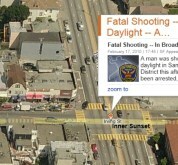 For example, a Twitter app displays geo-tagged tweets on the map – even if you’re in streetview. An app called “Local Lens” adds hyperlocal info from blogs and feeds to the map and the “What’s Nearby” app aggregates Yelp and Citysearch data to show nearby businesses and restaurants. These are the three biggest updates to the Bing Maps service, but there are more improvements too, including minor enhancements like integrated 1-Click Directions, simplified navigation controls, local search integration, and a lot more. For all the details, check out the Bing Team’s blog post.